Diets rich in carotenoid lycopene are associated with the reduced risk of prostate cancer according to several studies. In a prospective study of more than 47,000 health professionals followed for eight years, those with the highest lycopene intake had a risk of prostate cancer that was 21% lower than those with the lowest intake. Those with the highest intakes of tomatoes and tomato products (accounting for 82% of total intake of this carotenoid) had a risk of prostate cancer that was 35% lower and a risk of aggressive prostate cancer that was 53% lower than those with the lowest intakes. Other studies also reported that men with significantly higher intake of tomatoes and tomato paste, and men who consequently had much higher plasma lycopene levels, were at significantly lower risk of prostate cancer. Read the abstracts of the studies here. While there is a considerable scientific interest in the potential role of lycopene in the prevention of prostate cancer, the question remains whether these protective qualities of lycopene are associated with lycopene itself, other compounds in tomatoes or a combination of various factors. It should also be noted that the studies included only dietary lycopene from foods, namely tomatoes. It is not known whether lycopene supplements will decrease the incidence or severity of prostate cancer. A Review of Epidemiological Studies of Tomatoes, Lycopene, and Prostate Cancer. Lower Prostate Cancer Risk in Men with Elevated Plasma Lycopene Levels: results of a prospective analysis. Food sources of lycopene: tomato sauce, paste and soup; ketchup, tomato juice, fresh tomatoes, watermelon, pink grapefruit, pink guava, papaya, red bell peppers. Fruit with the highest known lycopene content is gac native of South-Eastern Asia. The lycopene content in gac is up to 70 times higher than that of tomatoes. This food source is not available to the rest of the world. That's why tomatoes and tomato based sauces, juices, and ketchup account for more than 85% of the dietary intake of lycopene for most people. The content of this carotenoid in tomatoes increases as the fruit ripens. Unlike other fruits and vegetables where nutritional content is often diminished with cooking, processing of tomatoes increases the concentration of bioavailable lycopene because it is insoluble in water and is tightly bound to vegetable fiber. Processing releases lycopene and makes it available for absorption from the digestive tract into the bloodstream. 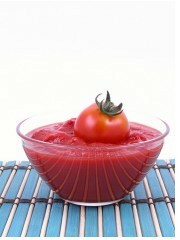 Lycopene in tomato paste is four times more bioavailable than in fresh tomatoes. For this reason tomato sauce, paste, juice, soup or simply tomatoes cooked in oil are a preferable source as opposed to fresh tomatoes. 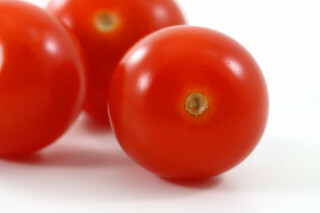 For the complete list of foods and Lycopene content in them click here.